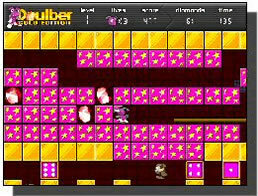 Doulber Gold Game - Download and Play Free Version! Help Doulber the ant find gems and get to the exit before time runs out! In a world filled with monster guards, menacing bats, crushing boulders, blazing lava and a labyrinth of caves comes an ant with a funny name and ready to combat the latest elements. 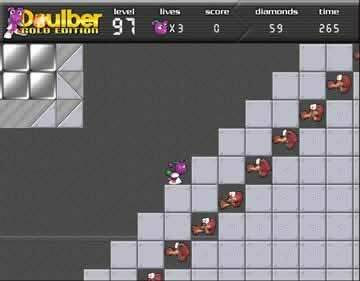 Doulber is a fun and simple action puzzle game. Use him to dig up blocks and get to valuable diamonds. Collect enough diamonds in the amount of time allowed and he can move on to the next board. Along the way he must tackle tricky targets, uncover secret levels, and solve more mysteries. 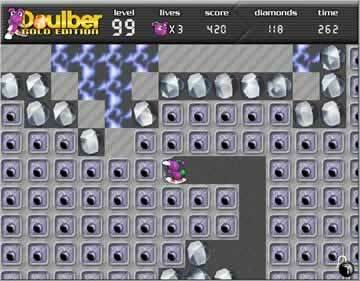 You must use your skill to help Doulber accomplish this huge mission - to explore 6 new worlds, to seek out 100 levels and new monster civilizations, to boldly go where no bug has gone before!